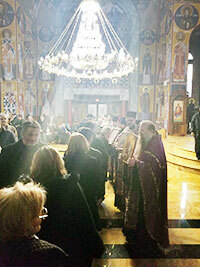 On Sunday, March 17, 2019, when the Church celebrates the Triumph of Orthodoxy over the heresy of iconoclasm, clergymen of the Russian Orthodox Church, Serbian Orthodox Church and Orthodox Church in America from the Toronto area, with portions of their flocks, prayed together at vespers service at All Saints Serbian Orthodox Church in Mississauga, ON. Archimandrite German (Bogojevic), Abbot of Transfiguration of the Lord Monastery in Milton, led the service, which was performed in Church Slavonic, English and Serbian. The church was filled with several hundred faithful who all received icons of St. John (Maximovitch) following the service. More than 200 people then remained to hear a lecture by Very Reverend Fr. Jovan Marjanac on topics pertaining to the ongoing crisis in Ukraine: the history of Orthodoxy in Kievan Rus’ and of Ukrainian Orthodoxy in Canada. The lecture concluded with a reading of the Serbian Church’s official position on the Ukrainian crisis. A panel discussion also highlighted the importance of upholding the sacred canons of the Church, regardless of nationality. According to the diocesan report, a parishioner from a local Greek parish under Constantinople assured everyone present that the vast majority of those in the Greek churches acknowledged that Constantinople has made a serious mistake. Archimandrite German closed the evening recalling the shining examples of Patriarch Pavle of Serbia, Alexei II of Moscow, Metropolitans Anthony (Khrapovitsky) and Laurus (Skurla) and Archbishop Anthony (Medvedev) of ROOCR, and Sts. Mardarije, John (Maximovitch) and Nikolai of Zicha, and reminding all present that although Orthodox cannot pray with schismatics such as Philaret Denisenko and Epiphany Dumenko, we have an obligation to pray that the Lord would enlighten them and guide them to repentance.